This 2,400 square foot, three-bedroom, two-bath home is a celebration of one of Dallas’s best architectural firms of the mid 20th century, Hidell and Decker, who originally designed this award-winning home in 1951, and one of the best current architecture firms with a passion for midcentury modern architecture, Bodron+Fruit, who designed the modern renovation in the 21st century. 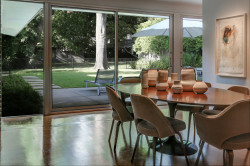 Whether you are wild about midcentury design or just have a passion for modern architecture, you will love this home. 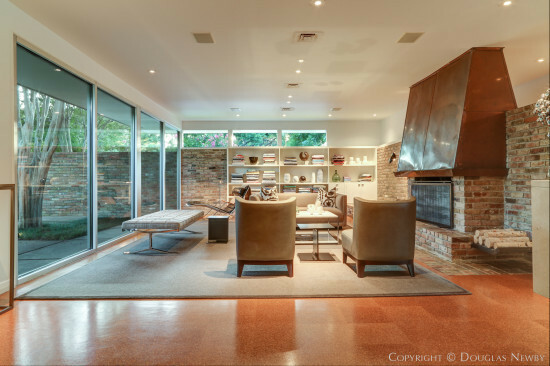 This architecturally significant home reflects the best of the design era in which it was built (1951), with cork floors, its floating walls and open floor plan, continuous brick walls into the garden and classic 1950s carport with translucent side panels. The original hand-crafted copper hood over the living room fireplace and the new cork floor root the home in materiality and style. 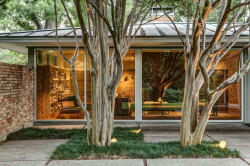 The floor-to-ceiling windows looking out the front of the home to a grove of crepe myrtles, or walls of glass, windows and glass doors wrapping around the rear courtyard providing views of the garden and 100 foot wide Greenway Parks greenbelts running along the back of the property create a transparent delineation of house and materials. In the golden days of AIA Dallas, the emerging chapter was led by architects of mythic reputations. 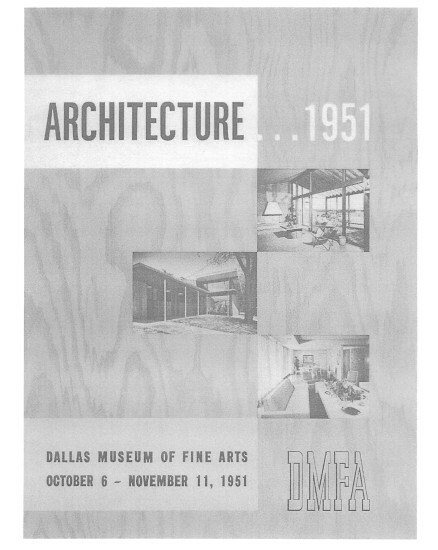 Arch Swank was Dallas AIA president. 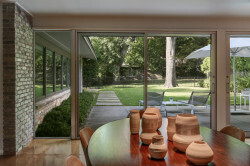 He is known for his brilliant midcentury designed homes and for having collaborated with O’Neil Ford in the 1930s. Arch Swank was honored at the 50 Significant Homes celebration for the Dallas Chapter AIA 50th anniversary. 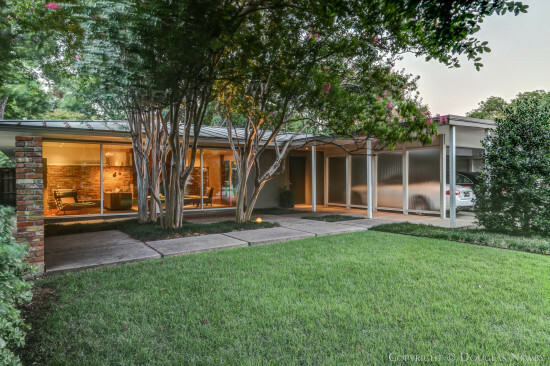 Architect Harold Prinz, another master of midcentury deigned homes, was the Dallas Chapter AIA treasurer. In 1951 Bill Hidell and Howard Decker received one of three residential AIA awards along with Dave Braden (future AIA president), president of the Citizens Council, and a nationally recognized architect. Arch Swank’s well documented and still admired Bearden house in Culture Gultch, in University Park, received a runner-up mention to the awards received by Dave Braden and Hidell and Decker. The work of Hidell and Decker was held in the highest esteem by these architectural legends, architecture critics, and by architects today. 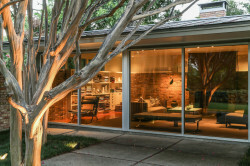 The AIA architectural jury admired the “handling of the wall which extends from the west end of the living room to enclose the garden.” This continuous brick wall is just one element that connects the design of the interior with the exterior and nature. The running fireplace brick wall of the living room creates the depth proportion and balance of the courtyard that captures indoor and outdoor spaces with the glazed wall, physically separating the interior and exterior. Architect David Williams, who designed the Greenway Parks neighborhood, is the Texas architect who brought so much attention to the importance of designing homes to shield or capture the sun, much like the early indigenous homes of Texas that inspired his work, along with the modern architects of Europe. When architects Bill Hidell and Howard Decker designed this modern home, they were mindful of the Texas environment. Floor-to-ceiling glass and walls of glass are found on the east, north and south side of the home, allowing soft light to fill the home. The long horizontal windows on the west side of the home, with the harsh afternoon sun are raised over the brick wall and just under the four-foot wide overhangs that shield the harsh summer sun but still allow sunlight in the winter when the sun travels low on the horizon. As this is a home built on a corner lot, the extended interior and exterior brick wall also mutes any traffic noise to the west. The home opens in three directions: to courtyards and gardens enjoying soft sunlight and breezes. Mil Bodron and Svend Fruit have a respect and passion for midcentury-designed homes and a desire for spare, open rooms of the 21st century. Bodron+Fruit kept the original footprint of the house and the essential elements of the plan. 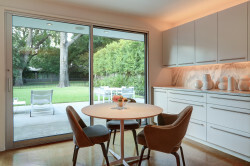 The kitchen was further opened with a wall of wide floor-to-ceiling glass doors so compellingly compatible with the design, one would think this glass element was original. The rear garden is so beautifully proportioned against the backdrop of greenbelt, one would never suspect the current owners purchased the home next door to add some of that land to widen the garden and make the home at 5303 Waneta feel even more open. Floating walls, lots of glass, and perfectly proportioned rooms keep the spaces open and the floor plan fluid. The continuity of materials and sleekness of finishes contribute to the contemporary modernity of the home. The raw surface of the original brick living room wall, wrapping around into an exterior courtyard, contrasts with the white floating wall that keeps the kitchen open. The honed white Danby marble countertops and backsplash, along with stainless steel, provides an elegant luster and sheen in the kitchen that is designed for both cooking and entertaining. 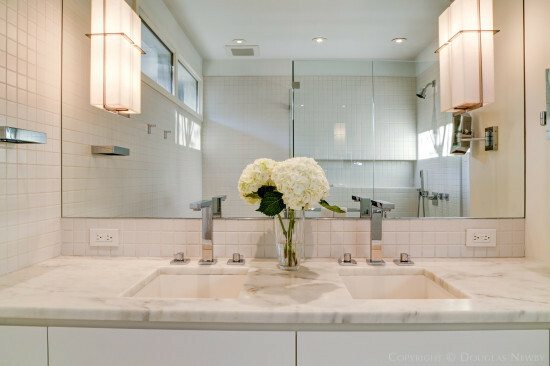 The honed Calcutta marble countertops in the master bedroom also contribute to a modern elegance. The copper fireplace hood and cork floors add a warm glow at twilight. 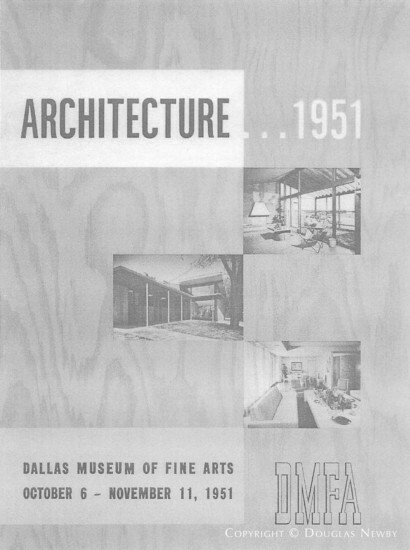 Sixty years ago the resources available to an architect were fewer. Midcentury modern architectural design has remained timeless. Today, the architectural and aesthetic resources available and deployed by Mil Bodron and Svend Fruit are able to accentuate the design and contemporary appeal. For instance, the sleek laundry room now has a Miele washer and dryer. The master bathroom has a heated marble tile floor. The kitchen has all Miele and SubZero appliances. 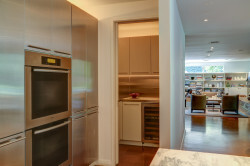 The wet bar adjacent to the kitchen has an instant hot water dispenser and a SubZero 48-bottle wine refrigerator. Just as the cork floor provides continuity throughout the house, byrdwaters DESIGN has created a Lutron low voltage lighting design that pleasantly connects each room. 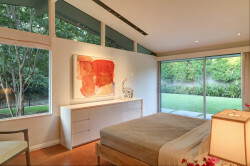 Automatic shades with remote control add a subtle luxury to the TV room and master bedroom. Just as the low voltage lighting permeates the home, so does the sound of the home theater with whole house audio. Natural gas directly to the exterior grill encourages you to do more of your cooking outdoors where you can enjoy the garden and greenbelt. My experience has been that period architects were obsessive about the engineering and quality of the building. This is true about Hidell and Decker when it came to the quality of construction. The quality continued with the complete renovation by Bodron+Fruit that included a new standing-seam metal roof in 2003 and new contemporary insulated windows. The electrical panels were updated in 2010 and the two zones of central air and heat were updated in 2006. 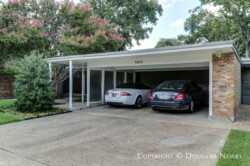 The carport has service storage for garbage cans and closets for those items often found in a garage. This Greenway Parks home has been protected, burnished, opened up, and accentuated with modern technology. Boyd Heidrich Bargas was the landscape architecture firm that designed the landscape. 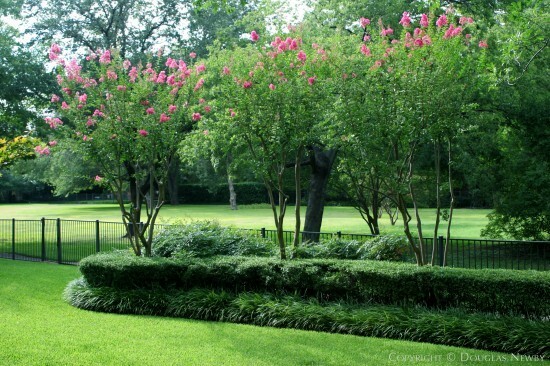 In the 21st century Boyd Heidrich Bargas collaborated with Mil Bodron and Svend Fruit on this project to provide an environment that protected the grove of mature crepe myrtles in the front courtyard and the oak tree on the border of the greenbelt. Boyd Heidrich Bargas created a clean contemporary garden with perfectly placed oversized stone rectangles that frame the garden and create a walking path to the greenbelt. The landscape edges are architectural and still soft. The sprinkler system is divided into eight zones and the mosquito misting system ensures you can enjoy the outdoor living areas all year. Exterior lighting further blends the boundary of interior and exterior spaces as the light is balanced inside and outside the home. When you are entertaining in the evening, guests move easily between these two environments that feel like one. There are so many reasons that Greenway Parks is considered the most desirable neighborhood in Dallas. 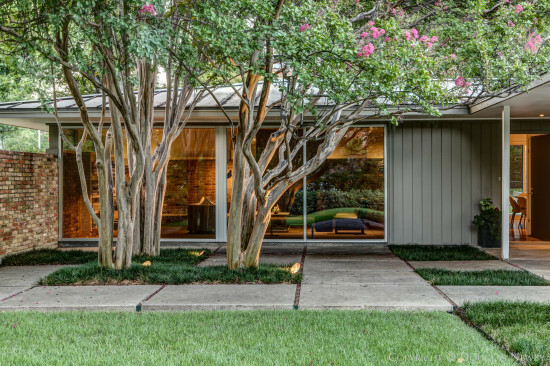 David Williams, the godfather and creator of Texas Modern style, designed this neighborhood. From the beginning and continuing today, the neighborhood has attracted those interested in art and architecture, from art museum directors to art museum presidents, sophisticated art collectors and patrons of architects. Greenway Parks is designated a conservation district so the homes in this well defined neighborhood of boulevards and greenbelts may continue to be preserved and, in many cases, homes may be passed down from one generation to another. You feel an intimacy with your neighborhood because you are separated by a three-foot open fence rather than high hedgerows and solid fences. At the same time you have far more privacy and are removed from those who live behind you. At the rear of the property, instead of looking straight into the back of a two-story garage and quarters as is the case in many neighborhoods, you will enjoy looking over a 100’ wide greenbelt and the trees of your neighbor’s back yard. As a homeowner for $1,800 a year you may subscribe to the 24/7 off-duty police officers who patrol the neighborhood. 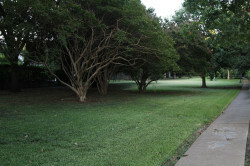 Whether you see your neighbors at one of the many neighborhood parties or step through your back gate to walk your dog and see your neighbors in the greenbelt, you will enjoy the lush and friendly atmosphere of Greenway Parks. In Greenway Parks you are only one stoplight from the Tollway, only six miles from the Arts District in downtown Dallas, and within walking distance to both Highland Park Village and Inwood Village. Greenway Parks is also in the private school corridor and only minutes away from many of the finest preparatory schools. 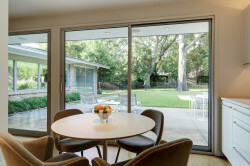 Greenway Parks Reflects the Finest Environment and Neighborhood for a Midcentury Modern Home. While the profiles of the Greenway Parks residents might be substantial, the homes are restrained in size, so a midcentury modern home will never feel overshadowed. Modern homes are known for windows and light, but often are compromised by the canyon effect of the surrounding huge houses. 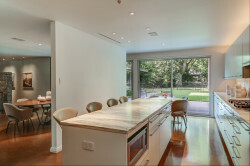 The modern home at 5303 Waneta will always have sunlight streaming in and extraordinary views to gardens. I am confident you will agree with me, that you will be hard pressed to think of a home that better represents modern design from two centuries.